Here you will find histories of various embroidery techniques, styles, stitchers and topics. I am aiming to highlight the role of embroidery throughout time, so you can see how what we do now has its roots in what was done then – and what may be done tomorrow! 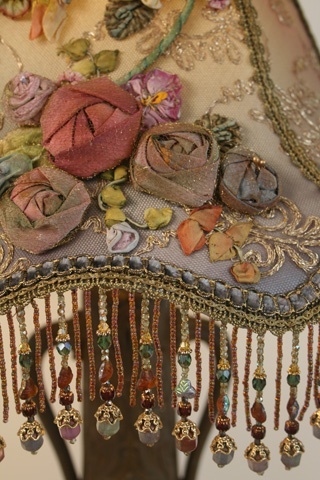 During the Victorian era (1837-1901 CE), ribbons were extremely popular. The women of this time loved the intricate woven ribbons that were made possible by the Jacquard looms and used them with abandon. 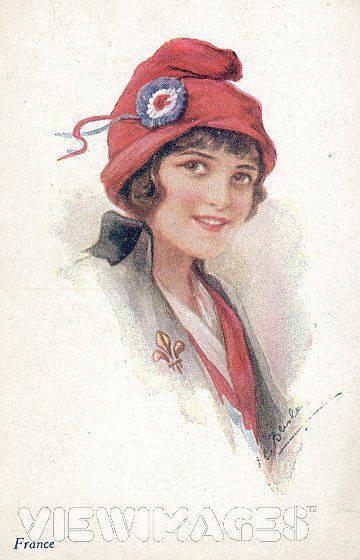 The French and English were using ribbons to decorate household goods and clothing, including hats, shawls, parasols and reticules. Americans also used ribbon in their homes and clothing, but with more restraint. There are a couple of reasons why this was true. Some think it could be a result of early Puritan influences, or perhaps was a manifestation of the common anti-English sentiment of the times, or maybe it was because imported ribbons were expensive and hard to obtain. It is not really clear, but over time the American market has come to appreciate and use all types of ribbon. One interesting early American experiment was the manufacturing of ribbon by a group in Pennsylvania. The Moldavian School for Girls taught ribbonwork and silk ribbon embroidery to their pupils and decided to make their own silk ribbons. They tried raising silk worms to provide the raw materials needed for the ribbons, but a harsh winter killed all the mulberry trees they had planted. 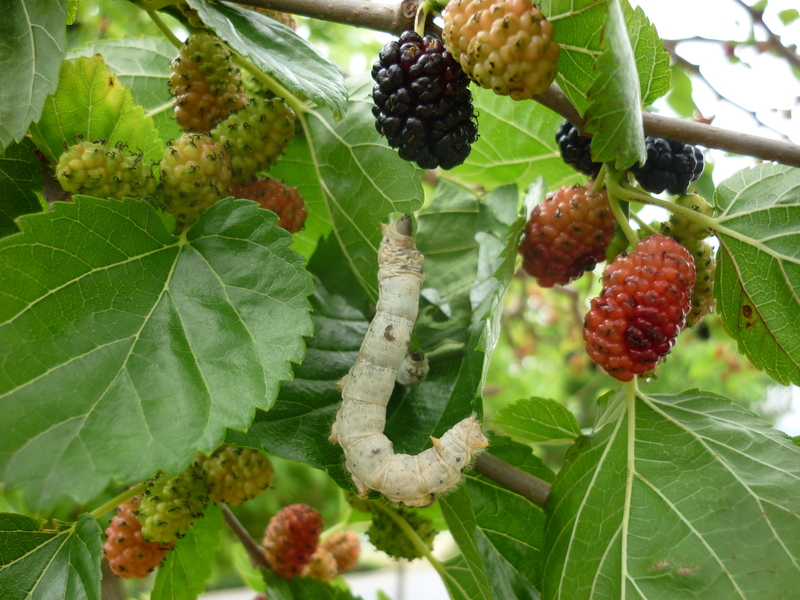 Since mulberry leaves are the only food silk worms can eat, the venture did not last very long. While this experiment did not go far, other more commercial interests took up manufacturing ribbon with more success. In 1815 William H. Horstmann opened a plant that manufactured “all sorts of trimmings”, which included ribbons. In 1824 he brought the first Jacquard loom to America. Modern ribbons are made of materials such as paper, candy, metal, jute and various synthetic materials, as well as traditional fabrics like velvet, silk and lace. Today North America is the largest importer of ribbon in the world. Although we do use ribbons to decorate clothing and household items we use them for a lot more! Ribbons are used for everything from decorating our hair and our gifts, to keeping our money supply safe . Ribbons are used to honor actions and accomplishments, for dancing and in solemn ceremonies, as a sign of approval and quality, and to make statements and carry instructions . We even stitch with them! In the next part of this article I will look at how we came to use ribbon as an embroidery thread. During the Rococo period in France (1740-1790 BCE), ribbons were very popular among the wealthy as they tried to strengthen their ties to the noble class. Fancy ribbons woven of silk and other expensive fibers were especially suitable for decorating clothing, and were used with abandon by those who could afford them. The ribbon’s elegant frivolity reflected the graceful playfulness of the Rococo movement. 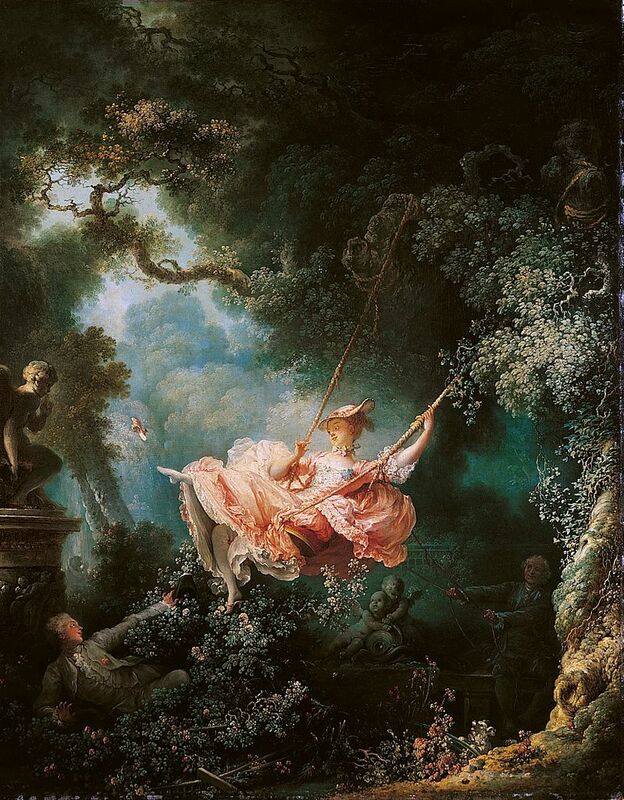 Rococo artist Jean-Honoré Fragonard’s famous painting, ‘The Swing’ shows a woman of this period with ribbons decorating her hat, shoes, the edges of her sleeves and hem, and the bodice of her gown. She even has ribbons at her neck! It is a good example of how ribbon was used to decorate clothing of the French aristocracy. At that time a woman could change her dress up to seven times a day and each outfit required coordinating shoes and hair appointments, which were often embellished with ribbons. Ribbons were also popular with the men who wore huge rosettes made of ribbon on their coats, hats and shoes. Ribbons played their small part in the economic unbalance that led to the French Revolution. Although the common people were in desperate need, wealthy men and women adorned themselves with as many expensive ribbons as they could get their hands on. Then the citizens of France had their turn. During the revolution, ribbons were used to identify who was supporting the common citizenry and who was supporting the aristocracy. Cockades of red, white and blue ribbons were adopted as the symbol of support for change. Perhaps we could consider these cockades to be the ancestors of modern ‘awareness’ ribbons. During the revolution, it was unsafe to be seen in public without a cockade to show support for change. The demand for ribbons remained strong since all of the citizens of France were using ribbons for their own purposes. At this time ribbons were woven as a cottage industry in France, England and Switzerland. A family could rent a loom and materials from a ribbon manufacturer and sell them back the finished ribbons. It was a slow process and this made ribbons very expensive. In 1801 a revolution occurred when Joseph-Marie Jacquard invented a new type of loom. Jacquard looms wove cloth in intricate patterns using an automated punchcard system that lifted each thread individually . This punchcard system is credited as being the idea behind modern computers. The Jacquard loom totally changed the weaving industry and had a similar effect on the ribbon market. Jacquard looms produced multicolored fabrics with intricate weaves almost as quickly as they could weave plain fabrics. Within 15 years ribbon manufacturers had adapted Jacquard technology to allow multiple multi-colored ribbons to be woven at once. 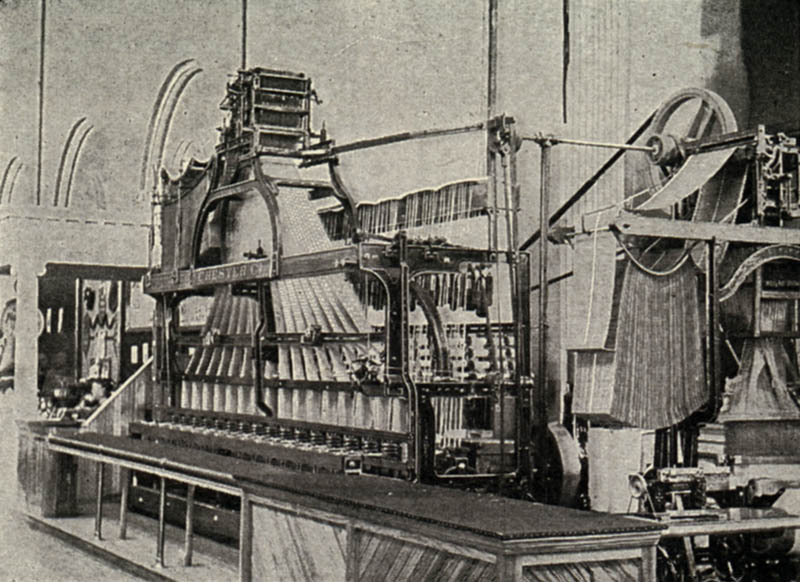 This loom shown is weaving sixteen souvenir picture ribbons at the same time. Ribbons were now cheaper and easier to obtain and soon became common items in the wardrobes and homes of ordinary citizens. Weaving ribbons one at a time was now obsolete. Silk ribbon embroidery has a surprisingly short, but very interesting history compared to other stitching techniques. While the technique has not been around for long, the ribbons themselves have a very long history. In the first two parts of this series, I will cover the history of ribbon itself, then tackle the development of ribbon embroidery as an embroidery technique. When people began to weave cloth, somewhere between eight and nine thousand years ago , they used the same materials and tools to weave narrow bands of cloth that we know as ribbons. Today, ribbons are defined by the textile industry “as a narrow fabric, and it ranges from 1/8 in-1 ft (0.32-30 cm) in width”. Early ribbons were used for practical things like tying together bunches of herbs and as closures on clothing. 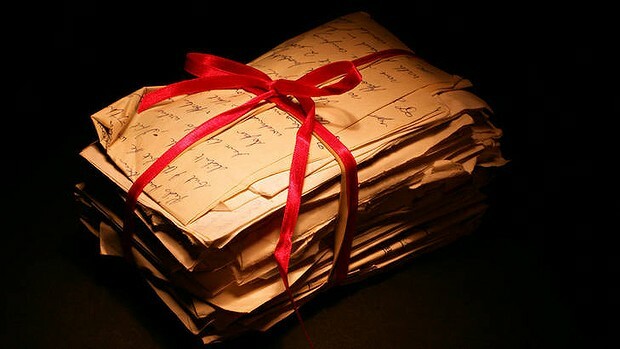 Ribbons were used to keep papers together as early as the 13th century, until this job was given to the paperclip in 1899 . Soon ribbons became decorative accents for personal items. Ribbons with both edges finished as part of the weaving process became common by the 16th century. Ribbon was used in Asia far earlier than in Europe. 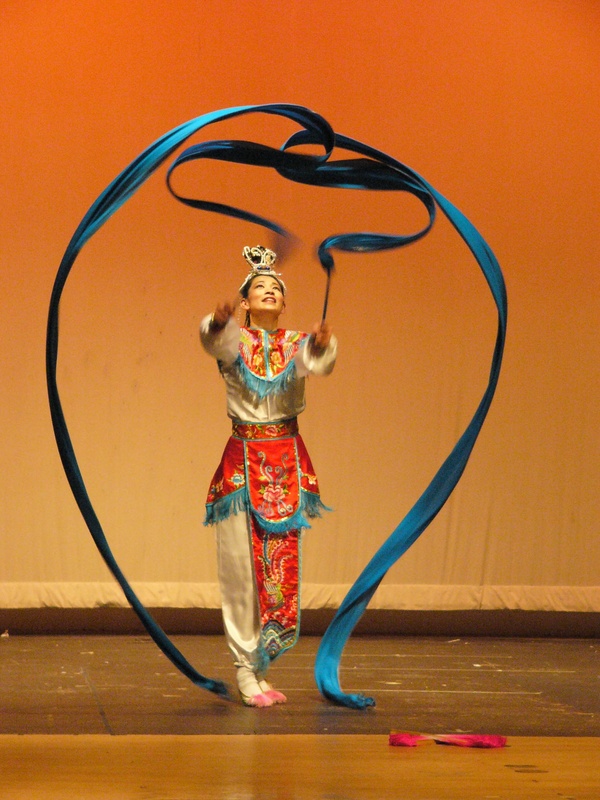 In China ribbon was used in their traditional Ribbon Dances beginning in the Han Dynasty (206-420 CE). The dance was developed to honor Hsiang Po, who thwarted an assassination attempt on the Han Emperor. He used his long silk sleeve to block the sword of the assassin. The ribbons in the dance represent his sleeves and are waved around in graceful patterns. Originally the ribbons were attached to the sleeves of the dancers; later longer ribbons were attached to small sticks to add energy to the dance. In Europe ribbons were very popular by the Middle Ages (500-1400 CE). They were used as decorations for anything from hair braids to shoes. Peddlers sold them as they traveled from town to town. In Geoffrey Chaucer’s Canterbury Tales, he even mentions a ‘tri-colour riband’ stuck into the hats of Constance’s three escorts in The Frenchman’s Tale. During Renaissance times (1400-1550 CE), silk that had traveled from the Orient along the Silk Road was being woven into ribbons along with other precious metals, like gold and silver. Within a hundred years ribbons were covered by sumptuary laws, which restricted their use to those who were noble. During the time of the Reformation, many Huguenot ribbon-makers fled France bringing silk ribbon weaving to Basel Switzerland. The area soon developed into a major ribbon-manufacturing hub that is still known for high quality ribbons with lovely delicate designs. Embroidery can be considered an anonymous art, in that much of the time it is not signed or dated, especially work done before the 17th century. The samplers and other embroideries that have survived the ravages of time allow us a peek into the lives and attitudes of the girls and women who created them – from their perspective. This is one of the main things that samplers do – communicate. Early samplers shared patterns and helped their creators retain the information they had gathered. Later samplers became a way to communicate ownership and information about the world. They helped teach young girls about their place within society. Just as women of the past used their samplers to retain and share information, we continue to do so today. Modern samplers ask us to consider our roles as creators who use embroidery to communicate a message through our work. In the Bible it says that by our fruits ye shall know us. Our samplers are the fruits of our hands. We have worked into them a message for those around us. We may not have done this intentionally, but the message cannot help but come forth. The women and girls that plied their needles in the past had no intention of sending a message down through the ages to us, yet we take meaning from their surviving works. It will be the same for us. So the question really is: what does our stitchery tell about us? Steven Wang said, “History belongs to those who dare to write it.” I say our stitchery is our history. It is what we leave behind for future generations. We created it and it reflects our reality. Let’s send a clear message to help future generations understand our times – from our perspective. Samplers began to be used as teaching tools in the education of young girls. Some samplers taught the more practical skills of plain sewing, while others focused on ‘fancywork’. Many had verses added to teach the alphabet, encourage morality and promote good conduct. 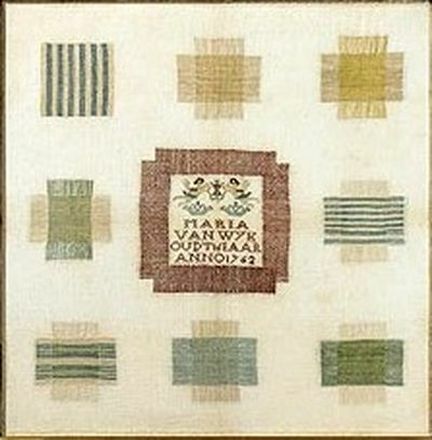 An example of a practical sampler is Maria van Wyk’s Darning sampler, stitched in 1762 when she was a 16 year-old girl in Nijkerk, Holland. It shows different types of darning stitches that Maria could use to repair holes in fabrics. You can see that cloth was much more readily available, but still expensive enough to warrant repair, since Maria paid attention to the design of her sampler as well as the stitches. Her sampler is beautiful as well as useful. By the 20th century sampler making had fallen out of favor along with the general practice of needlework. Those who created samplers often did so as an exercise in a particular embroidery technique rather than for basic educational or reference purposes. Samplers remained examples of the needle artist’s proficiency in a particular technique. Modern samplers continued to serve as a practice tool when learning a new skill, and as a way to experiment with different combinations of fiber, stitch and design, but they also became a connection to the past. Many of the samplers currently being stitched are reproductions of 19th century schoolgirl samplers. Today, needle artists connect with the past through the medium of embroidery, using the same materials, tools, and techniques as their predecessors but in ways that reflect the current realities of modern life. An example of this is the sampler Breakbeats, created by Andrew Salomone in 2009. This is how he explains his work: “It occurred to me that needleworkers used to have to make patterns and images to decorate fabric in the same way that contemporary music producers make beats and musical compositions by repeating and layering audio samples in digital sound editing programs. 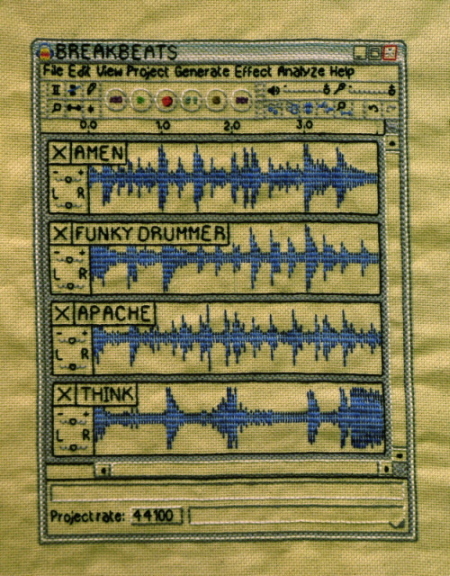 So the files created using digital editing programs today basically function in the same way that needlework samplers did in the days when all embroidery had to be done by hand.” Andrew’s sampler is more about the ideas than the techniques and is an intriguing way of connecting the past with the present. During the 17th and 18th centuries samplers continued to evolve, and eventually their primary purpose was to serve as showpieces for the stitcher’s skills. Other changes took place as samplers began to more closely resemble paintings. They became wider and shorter, and contained carefully positioned images that reflected a new concern with design and composition. Pictorial elements, many taken from the Old Testament were becoming increasingly popular. Biblical scenes and historical allegorical images were considered appropriate for young girls to stitch, since they contained images that encouraged good moral behavior. The many portrayals of Adam and Eve that are featured on samplers of this time were used as a way to teach young girls their role in the family and society. This example stitched by Elizabeth Summers in 1808, when she was an 11 year-old child, includes a verse from Genesis. 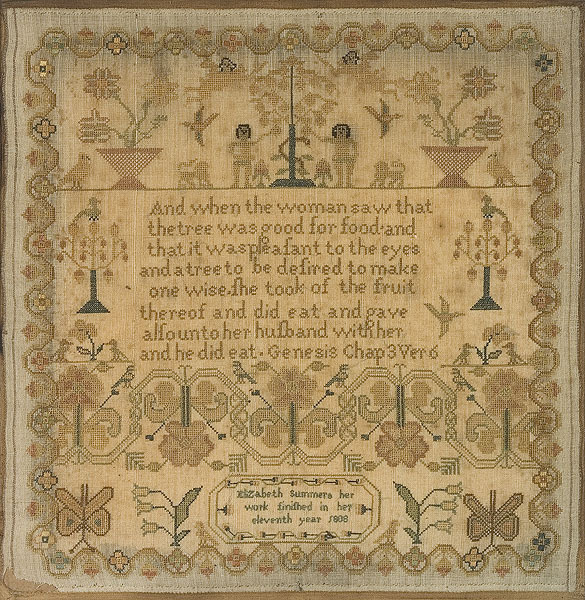 The images and verse were thought to teach the young girls who stitched these samplers the proper relationship between men and women. The time between 1720 and the early 1830’s was the height of the sampler. This is when the most iconic of the American ‘schoolgirl’ samplers were created. It is this type of sampler that comes to mind when samplers are discussed. Elizabeth’s Adam & Eve sampler is an example of a schoolgirl sampler. Other schoolgirl samplers depicted maps, calendars, lists of government officials, and family genealogies. They were used to teach letters, geography and the practical sewing skills that the girls of this era would need in their future lives. Day schools and Boarding schools that educated girls commonly included several hours each day of needlework as part of their curriculum. These samplers often included an alphabet and basic numbers, along with a morality verse and a picture and sometimes randomly scattered spot motifs that could be used later to decorate household items. These samplers hit all of the marks. They were most often stitched in cross-stitch, with other fancy stitches sometimes included. The complexity of these samplers would depend on the skill level of the embroiderer and her future prospects. A young lady who was of the working class would have been taught plain sewing, while the daughters of the wealthy trained in more ‘fancy’ stitches. Each girl began with the simpler stitches and motifs and then moved on to more complicated techniques, as their needleworking skills improved. By the end of the 19th century, samplers had moved from the workbasket to pride of place on the walls of upscale homes, serving as a showcase for the skills of the daughters and wives of the household. More importantly for historians, it became a common practice for the women and girls to sign and date their work. Huntley, Richmond, “Flashback: In Samplers Little Girls Express Themselves”, American Collector, April 1942, reprinted 20 March 2009, Collectors Weekly, http://www.collectorsweekly.com/articles/in-samplers-little-girls-expressed-themselves/ 6 Feb. 2013. Zen of Life makes it to the Big Show!